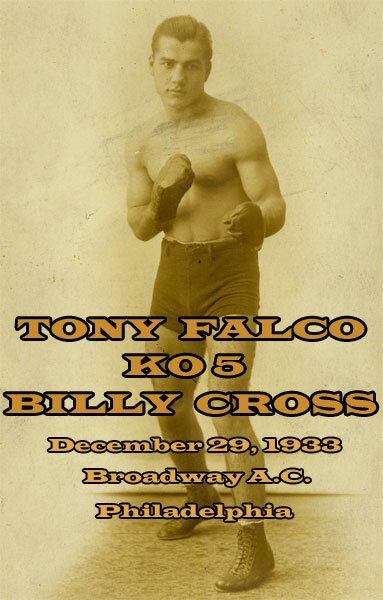 On this day in 1933, Tony Falco stopped Billy Cross in five rounds at the Broadway Athletic Club, on Broad & Christian Streets. Cross was a former amateur star from West Philly who stepped into this bout as a late substitute. But despite his short notice and experience deficit, he gave Falco a good fight according to the newspaper reports of the day. Tony Falco was a talented South Philly boxer who once climbed to the #1 contender spot in the jr. welterweight division. He started as a sparring partner for Benny Bass and eventually dropped 10-round decisions to his old boss on two separate occasions. In his nine years as a pro, Falco faced and defeated excellent fighters like Johnny Jadick (winning two of three bouts), Jackie 'Kid' Berg (W10), Ernie Caesar (W8, W8), Mickey Diamond (W8), and Harry Blitman (TKO8). He lost or split series with Eddie Cool (L6, L8, L10), Harry Dublinsky (W10, L10), Pete Nebo (L10, L10, W10), Lew Massey (L10), Frankie Klick (D8, L10), and Fritzie Zivic (TKO'd 8). Overall, Falco compiled a career record of 84-39-9 (14 KO). He was the older brother of welterweight Danny Falco.